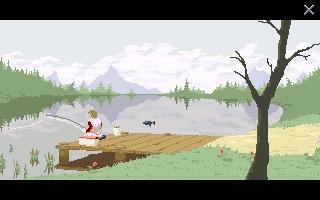 A re-envisioning of Scid's AGS classic, "Red Flagg - Don't call me Blue', Redux is a compelling tale of a 'day in the life' of everyone's favorite adventure game fisherman, Red Flagg and his time spent on a placid lake nestled deep in the forest. Join Red Flagg as he toils at the edge of an old wooden pier, working to survive off the land with only an old fishing rod and a beat up, garish bottomless cooler. Relive the highlights of the original Red Flagg now in HIGHER DEFINITION! Winner of the March, 2009 edition of the MAGS competition. "Wonderful remake with limited adventure." Amazing background and animating :) thank you. To quote from the old Peggy Lee song, "Is that all there is?"